Their history dates back to 1863 when First National Bank of Cincinnati opened for business. As regional banks proliferated across the country in the years that followed, a number of other predecessors were born. After a series of mergers at the turn of the 21st century, they formally took on the U.S. Bank name and established their headquarters in Minnesota. Their relationships are built on trust that they build every day through every interaction. Their employees are empowered to do the right thing to ensure they share their customers’ vision for success. Their diverse business mix is fundamental in delivering a consistent, predictable and repeatable financial performance year after year. Their core businesses include Consumer & Business Banking, Corporate & Commercial Banking, Payment Services and Wealth Management & Investment Services. Through their “One U.S. Bank” philosophy, they are able to bring the power of the whole bank to every customer, every single day. 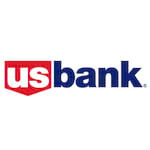 With $321 billion in assets, is the parent company of U.S. Bank, the 5th largest commercial bank in the United States. The company operates 3,086 banking offices and 5,086 ATMs, and provides a comprehensive line of banking, brokerage, insurance, investment, mortgage, trust and payment services products to consumers, businesses and institutions. I opened an account for my nonprofit about 6 weeks ago, and it has been a complete nightmare from end to end. The only bright spot is the staff at this branch, who were lovely, but can't overcome the disaster that is US Bank. When I opened the account (at the branch), it took a while, and rather than keep them past closing time, I told them they could just send me my debit card and PIN, which I didn't want anyway. What they apparently didn't know was that without a PIN, you can't set up your online account or anything else, as it is core to their security protocols. When the password I was given for the online account didn't work, I was stuck. After many phone calls trying to get that straightened out, I gave up and waited for the PIN to arrive. Then it didn't work. More calls, more snail mail, finally got a PIN that worked. The branch is maybe fine, but this is the worst bank I've ever heard of. You are only allowed up to 1000(at best, 500 if you want cash) dollars of your own money at a time. Also, they regularly take over a week to "clear" the full amount of checks. Who are their customers at this point? Closed account immediately. GO TO PNC INSTEAD (or ANY other bank. 1. They make policies in the branch to discriminate based on race. I was told by one of their employee who is a friend that they put a policy to not attest documents to shoo away middle eastern customers. 2. Phone wait times are terrible. They will ask you to fax documentation but their is no confirmation from their end as to if they received the fax. Their turnaround times are days each time you have to find information from them. Wait time on phone can last hours. So you can pretty much forget about whatever you want to do. 3. They have a very callous attitude and pretty much treat their customers as trash. Most horrible customer service and the worst bank ever. 4. After closing a CC, there was a refund. Called to get it refunded into a checking account. The guy got information and said it will be deposited. I am past 7 days from the time I put in a request, but nothing happened so far. 819 FICO Score and $1,200 limit?!! Tuh. I have 10k with discover it card! Waste of hard pull.. btw the pull Equifax in Georgia, not Transunion like the blogs say. I will bought visa signature cards came with a minimum 5k... clearly I was mistaken! I Just took about one hour of Zach Schultz’s time. He is St. Louis tucker branch manager of sales and service. Very courteous and patient. Looked up all info that I needed. All of the staff at that branch bend over for me EVERYTime I go in the branch. Love them. Def a five star bank. Had prefect credit (800 range) for 20 years until US Bank ruined it. They reversed 3 of my car loan payments for no reason (not one of the 25 reps and mangers I spoke to over the pat 2 weeks can explain why) and then notified all 3 bureaus that my account is delinquent and is not Paid As Agreed for 90 days. Every call to their customer service in attempt to get an explanation and a resolution turned out to be futile. After more than 12 hours of phone time including alot of hold and transfers from one person and department to the next (Customer Service, Credit Dispute, Lease Solutions, Loan Support, Lease Maturity, End of term, Total Loss and more). Horrible customer service, horrible turnaround times once loan was paid in full for lien release and title. Avoid like the plague! I would happily pay a higher a rate in order to never deal with them again. They mail you 3 letters a month about thier credit cards and now spam email to boot about he same damn card I don't want 7 years ago and dont want today. I only have a morgage with you, leave me alone!! I have been profoundly disappointed with the REI Mastercard and strongly recommend against it to anyone. I have been a member for several years with no issues until a month ago. I first noticed that the app I used to make payments was down due to technical issues; I was told to call customer service for assistance or try again later. I was also unable to make a payment using the online banking website due to technical issues. So, around 12/11/18, I called the 24-hour customer service line and was on hold for over 20 minutes until I was connected to a representative. During the call, I made a payment, and was also informed that my card had been shut down due to fraudulent activity. I waited for my new card to be mailed to me a few days later, and I immediately activated the new card and mailed in the requested documentation about the fraud. During these past weeks, I still have been unable to manage my account using the app or the online banking website due to technical difficulties. (My bank account is not an available payment method; when I try to add it, the website says that it's already added, but I cannot access it). Today, almost a month after the initial call to customer service to make a payment, my card is still declined when I try to use it and I am still unable to manage my account using the app or online banking website. Horrible in every way. Hurt my business and evil customer service. As a business owner, definitely stay away and I simply cant believe they are in business and haven't been sued yet. Beware and find another bank at all costs. 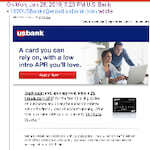 Us bank place your deosit on hold for no reasonor you but security reason for them. It is ridiculous because you can’t count on money you deposited to your account. I feel more unsafe to use this bank. I have a credit score of over 800 and have my pick of the very best credit cards. I have a card endorsed by my labor union through Bank of America, for which has excellent balance transfer offers and rates, Citi Bank Visa (used to be my Costco card too) which has a low revolving interest rate in case I need to carry a balance for a month or two, 2 Discover cards that provides balance transfer offers with no transaction fees for low interest on an almost which is almost always avaliable when I need it, A Gesa Platinum Visa card allowing me to transfer money to my checking at any time I need the extra money with no transaction fee transferring the money instantly as I wait on the phone, a Bank of America Cash rewards cards with excellent cash back,an Old Navy Rewards Visa card, which provides reward points for Old Navy, Athletica, Banna Republic, Gap and Gap factory and each dollar I spent I get a dollar back in reward points and has Excellent! Customer service so when the reward bucks expire they graciously reinstate to me within 3 billing cycles. I use to like this bank, but now theres been constant changes that you have to find out on your own. Anytime I have an issue knowone seems to be able to assist me to my liking. Mr. Review man gives 2 stars to Us Bank. I am having the weirdest experience with US Bank customer service. Unfortunately, I have two car loans with this bank and when one of my car loans was paid in full the account simply disappeared from their bank portal. The paid off check was sent on September 11, 2018 and still no news from them. Therefore, I decide to call customer service to inquire about it, and after waiting for a long time to talk to a representative, in two occasions they hang up the phone alleging that my personal information provided didn’t match their records. Useless to ask which other information I could provide to validate my identity. They simply repeated as robots that they had no option other than terminating the conversation right away, that I needed to walk in a US bank branch with ID’s; well I would like to but there is no branch in the state of FLORIDA, where I live. DO NOT GET THIS CARD!!! Unless you enjoy spending money expecting points and then make endless phone calls to US Bank and Kroger to get no help, no resolution... but always politely being told “ yes next quarter you will get those points”. Then repeat cycle - spend- call - and be told to wait till next quarter for rewards mailed. This bank charges fees for statements. And if you include check images on your eStatement, you get charged again. I was charged. I worked with a customer rep to fix the problem. Then was charged again and not allowed to fix the fee. I'm moving my money to a better bank. ATM made a loud beeping sound after attempting to Deposit more cash from first transaction, after that it attempted to process the transaction stuck on the "Processing" screen for 2-4 minutes and then "Network Error Message" Appeared.